OK, let’s start at the top of the card for answers. Maybe it’s the name. The sound of it. Cubs. The hard C collapsing immediately into the short glum “uh,” which gives way to the stubbing, stunting B sound, which reduces whatever power might have been the sound of the name of the long-suffering team to a sibilant, trailing-off S sound, a weak hissing like the last gasp of a broken radiator in a car on the side of a highway, other cars flying past, the drivers of those cars all thinking the same thing as they notice the poor sap peering into the smoldering open hood of his car: Glad that’s not me, stranded, fucked. Yes, maybe it’s the name. Cubs. Or maybe it’s the cap, represented here not by a photographed image but in a version imagined by a Topps artist and superimposed on a photograph. The imaginary version of it is in a certain way more real than the real version in that it highlights a certain key aspect of the Cubs cap, a cap that has been the same for as long as I have been alive. It looks, atop the head of Darold Knowles, more like somewhat sloppily applied cake icing than a cap. It looks like you could eat it, like you could dip your finger into the blue and red and get yourself a nice quick sugar high. Their real caps don’t look like this, not exactly, but maybe there is something in the cap, in the mild, friendly blue, in the taming of the racier red by restricting it to the confines of the basic spelling-block C, that invites a kind of metaphorical dipping of the finger into the icing. Maybe other teams, without even knowing it, look across the diamond at the Cubs and assume the attitude of a guy walking through an empty break room at work and noticing a cake just sitting there, waiting to be violated. 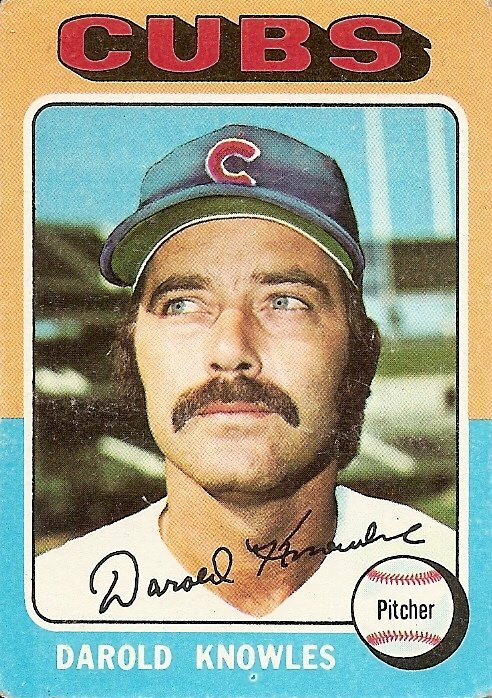 Or maybe, going lower on the card, to Darold Knowles’ face, it’s the feeling of doom. I don’t believe that teams are ever cursed, but I do think, and actually know from my own experience as a Red Sox fan, that year after year of disappointment and defeat tends to make one worry whenever victory seems close at hand. How is it going to go sour this time? What new unscarred section of my heart is going to get ground to bits this time? The nervous murmuring in the stands, along with the constant references to curses and droughts in the media, filters down to the members of the team. How could it not? How could it not in their weaker moments make them feel like Darold Knowles seems to be feeling now? He seems to be aware that something gloomy and horrible is descending, big and invisible, impossible to stop. To turn back the tide on all that, the name, the cap, the feeling of doom, you need to face it head on, I think. Lou Piniella, current manager of the Cubs, seemed to explode whenever asked about the last sad century of the Cubs. I think this strategy, trying to ignore the elephant in the room, getting angry whenever anyone mentions the elephant, is only going to make things worse. When the New York Rangers toppled their Cub-like demons in 1994 they did so by following the lead of Mark Messier, who embraced, rather than turned away from, the burden of history. They also did so by having a fantastic team, which of course is the first prerequisite to slaying curses, but the Cubs had a fantastic team going into these 2008 playoffs, possibly the best all-around team in baseball, and they got bounced in three games, playing tight, as if they had all seen the dark cloud that Darold Knowles seems to be seeing. You are currently browsing the archives for the Darold Knowles category.